Wow! What a surprise on a Monday morning! Awesome new design. Congrats!!! Hope that 2009 brings you guys lots of more great things! See you soon. Looking forward to more of your wonderful ‘this is Cape Town’ shots. Thanks, guys and all the best! Well done guys! It looks fabulous! What’s that electronic thing on the monopoly board? 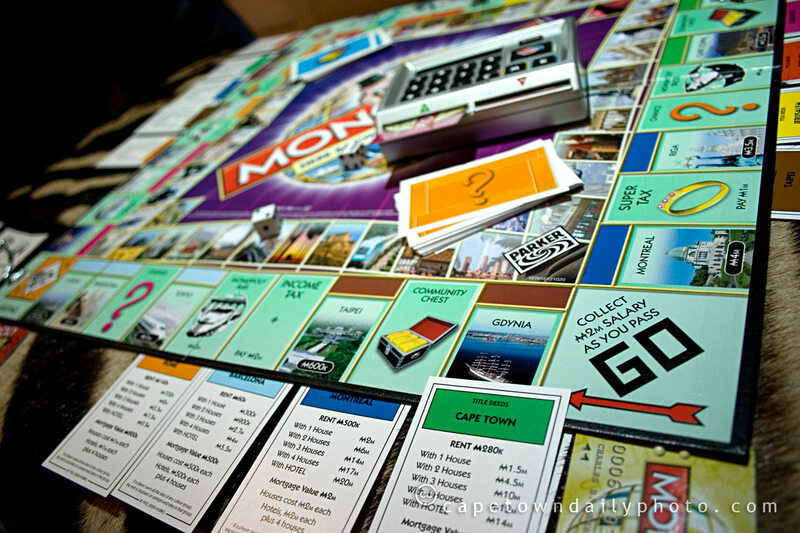 taking monopoly in to the new millenium? Ohh yeah! I like the new design. I also got myself the monopoly word edition a couple months ago. I haven’t played monopoly in a long time so the credit cards were a little new to me, but much better than fiddling around with paper money. Looks brilliant. I love the brown colours used. Slick guys, very slick! Not that there was anything wrong with the old site, but I do like this a lot! So, those useful Cape Town links; I hope that it will be expanding soon, with usefule groupings for all those local sites (with their web links etc, or feeds, or whatever), such as for the Table Mountain cable way, music in SA, food, wine estates etc that you guys have hyper links to already (or not). So when we are in a hurry, we don’t have to hunt through all the posts to find something we remember reading about. Oh wow!! what a surprise and I must say I like it very much..I’m so glad you’re going to continue with photo’s and links as before and my little book is already full of interesting places to visit and eat thanks to your blog over the past year! We arrive CT on Thursday so hope to see you soon. Amazing re-design! Well done guys, congrats and thanks for the awesome site. Wow, what a great design! And an excellent picture as well, I really like the explosion of colour. Thanks everyone for the kind words. We’re really (really) glad to have so much positive feedback. Thanks again everyone. It’s really cool that you took the time to comment. Am very late catching up but just wanted to say how great your blog now looks. Very slick as someone else said. Even down to the neat font that I’m writing in right now! Great.